A few days before Christmas, I told my boys that we should make a Winter Break Bucket list so that we had a plan for fun while they were home for two weeks. 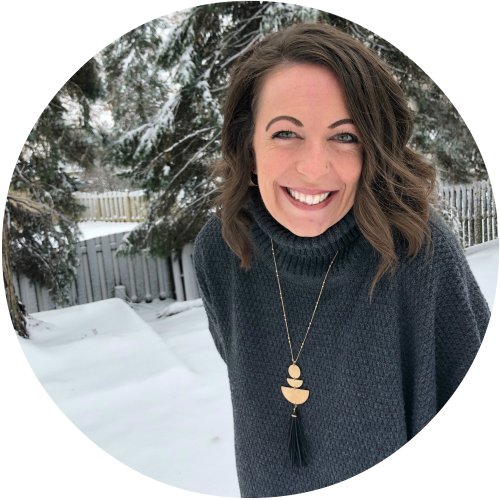 (We mommas know how important it is for everyone’s sanity to keep kids busy over winter break!) I barely got the words “what should we do?” out of my mouth when all three little voices started listing off their ideas and simultaneously yelled, “Go sledding!” Building snow forts was third on the list only to be beat out by roller skating. Well, unfortunately for the boys, no snow was to be had over winter break. However, once the ground did get a dusting of snow covering it, the boys were out the door in a flash with shovels in hand. For me, with the thought of snow comes dreams of cozy blankets, cozy fires, candles, slippers and an extra large glass of wine. When mother nature dumps a blanket of fresh fallen snow on our doorsteps, you’ll find me in hibernation mode. However, you’ll find my boys tunneling across the yard with the neighborhood kids and making snow forts to hide out in while they attack each other with snowballs. And they couldn’t be happier. The fresh air and burning off energy through physical activity is so healthy for their little bodies even when the temps take a dip. 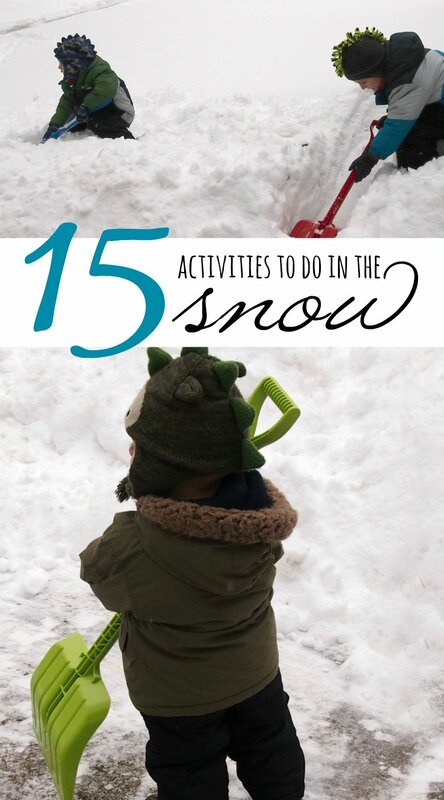 So to promote outside play in the winter white, we’ve created 15 fun-for-the-whole-family snow activities. BUILD A SNOWMAN. This may seem obvious, but the truth is you can switch it up in a fun way. Use candy to decorate the snowman’s face, consider sunglasses instead of buttons on their eyes or even use a funny hat. GO SLEDDING. Sledding is such a fun and exciting activity. Bundle up, grab a thermos of hot chocolate and hit the hills. HAVE A SNOWBALL FIGHT. Snowball fights are almost a prerequisite over the cold and blustery winter months. BUILD A SNOW FORT. Forts are a fun and creative way to spend time together in the snow with your family. A great way to make a fantastic fort is to use an old loaf pan to make “snow bricks”. Our boys received (affiliate link) plastic snow/sand brick makers with a plastic handle on top for Christmas and they love them. The handle on top makes it easy to slide the mold off the snow. MAKE FUNNY SNOW FOOTPRINTS. See who can make the best funny footprints in the snow. Or go looking for animal footprints. See if you can follow them around the yard. PAINT THE SNOW. Fill a spray bottle with water and food coloring and head out to spray paint the fresh fallen snow in beautiful colors. MAKE BEAUTIFUL SNOW MOLDS. Using items from your home, make gorgeous snow molds. Things like bunt cake pans make for beautiful creations. GO ON A WINTER SNOW SCAVENGER HUNT. 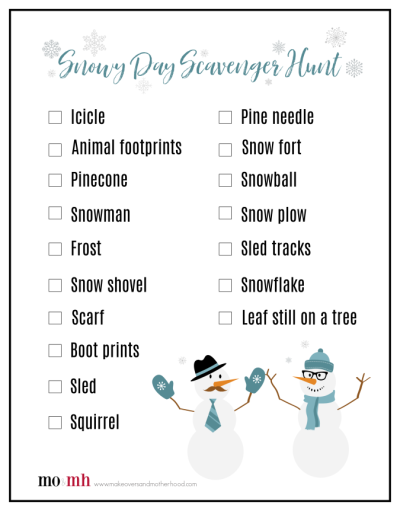 Print off our free snowy scavenger hunt printable and set off on an adventure. First person to check everything on the list off, wins! CREATE A SNOW OBSTACLE COURSE. This one is almost as fun to make as it is to participate in once it’s finished. Dig and build to make snowy obstacles that have to be conquered, then time everyone as they race through the course. GO SKIING. Skiing is so much fun and the snow makes it the perfect winter adventure. Even if you don’t have real snow, most skiing hills make “fresh powder” so you can still get in some snow fun. TRY SNOWSHOEING. If you haven’t tried snowshoeing yet, you are missing out. Enjoy the great outdoors and learn something new. MAKE SNOW CASTLES AND TOWNS. At the beach you build all kinds of sandcastles and little communities, why not do it with snow too? GO ON A SLEIGH RIDE. There is nothing quite like going on a horse drawn sleigh ride in the snow. MAKE A SWEET TREAT. If there is fresh fallen snow outside your door why not try a new sweet treat? Pour a little fresh maple syrup on top of the snow and using a popsicle stick, swirl the stick around in the syrup until you have what almost resembles a maple syrup lollipop. It’s delicious. BUILD SNOW CHAIRS & A SNOW TABLE AND HAVE A PICNIC. Picnics aren’t just for summer. Build a little outdoor seating area, pack a lunch of warm soup and hot chocolate and enjoy a warming winter picnic. 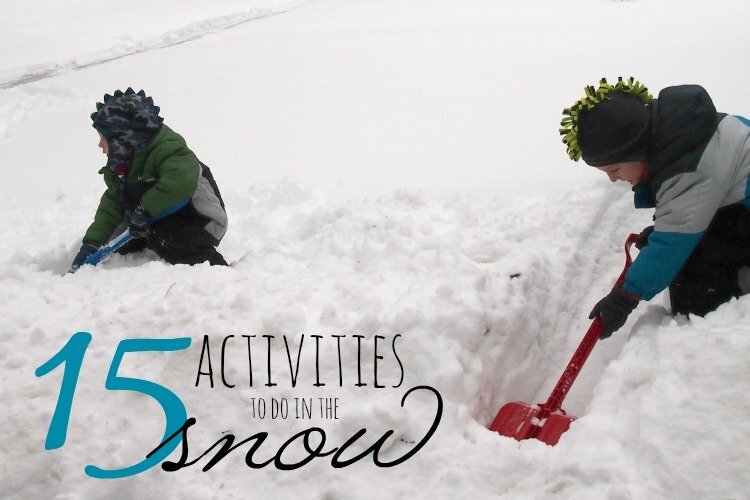 Whether you’re still waiting for winter to powder your lawn in white or if you’re already in full blown, bundled up like an Eskimo make-the-snow-stop mode, these snow activities will provide hours of family fun… enough that mom might even come out of hibernation to bundle up and throw a few snowballs!